As I mentioned in my previous column, employee engagement in a disruptive environment is an emerging challenge. There was an exploratory study involving more than 12,000 employees recently done by the Postgraduate Institute of Management (PIM). Today’s column is all about employee engagement in the Sri Lankan workplace, with the aid of a fresh “12 S” framework. “5 S” approach for better housekeeping is popular in Sri Lanka. 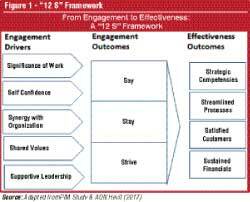 “12 S” framework for employee engagement is refreshingly new for Sri Lanka. It connects employee engagement to enterprise effectiveness. As we saw in my last column, employee engagement refers to his/her psychological state (e.g. one’s identification with the organisation), his/her disposition (e.g. one’s positive feeling towards the organisation) and performance (e.g. one’s level of discretionary effort). In brief, it captures affective (feeling), cognitive (thinking) and behavioural (acting) dimensions of an employee. According to Forbes magazine, the issue of “engaging people well” is becoming one of the biggest competitive differentiators. It further reveals that in a 2014 Deloitte Global Human Capital Trends research, 78% of business leaders rated engagement as something urgent or important for them. We at the PIM deployed six final year students to study employee engagement in three industries. Let’s discuss the details further with the aid of figure 1. Employee Engagement (EE) in the apparel sector and Information Technology (IT)/IT Enabled Services (ITES) and Knowledge Process Outsourcing (KPO)/Business Process Outsourcing (BPO) services industry in Sri Lanka was our main focus. T. Mukunthan, A. S. Hameed, F. F. C. Ajward, S. N. Jayasinghe, J. P. Peter and W.L.A. Pathirathna were the final year MBA students who got involved. They had to develop a scale to measure and to use that scale in the above two industries. The apparel sector is one of the largest contributors in export revenue in Sri Lanka. In addition, IT, KPO, and BPO sectors have been identified as potential key growth areas in Knowledge services sector with the potential to create export revenue. However, low productivity and low quality have been identified as major issues prevalent in the Apparel industry, while staff turnover has been identified as a significant issue in the IT and KPO, BPO sector in Sri Lanka. Therefore, the degree of engagement level in these sectors was questionable. As a result, these sectors were selected for this survey in order to measure the level of EE and identify what drives EE in these sectors. 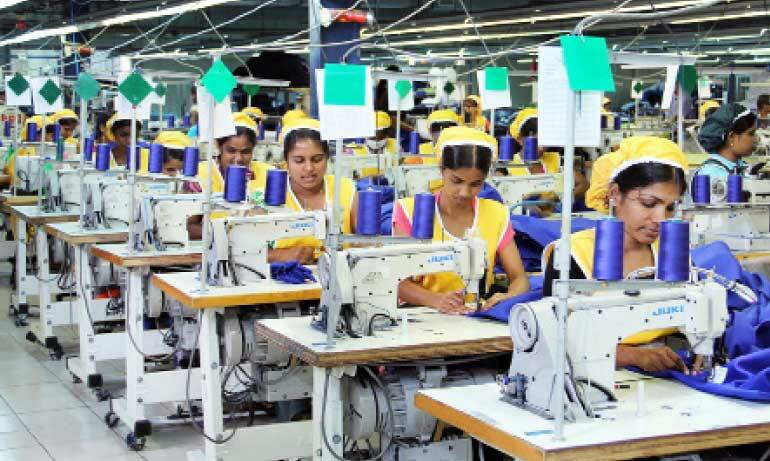 The study population of the apparel sector consisted of executive and operational level employees in five Export Processing Zones (EPZs) – (Seethawaka, Biyagama, Katunayake, Koggala and Mirijjawila) and fifteen Apparel companies outside the zones. The IT, ITES and KPO/BPO sample consisted of managers, executives and non-executive level employees mainly from the Colombo District. The total population reached was 17,113 of which 10,766 responses were collected. 10,412 valid responses were reached after rejecting 354 achieving a response rate of 63%. The survey was carried out using two methods, i.e. : through printed questionnaire and online survey. The questionnaire was developed by the researchers, which included 36 questions. Out of that, 21 statements focused on identifying and measuring EE and 15 statements focused on identifying the drivers of EE. All questions were answered in a five point Likert scale, where 5 being “Strongly Agree” to 1 being “Strongly Disagree”. Based on the Statistical Packages for Social Sciences (SPSS) analysis (included Exploratory Factor Analysis and Confirmatory Factor Analysis) the researchers finalised five new scale dimensions of EE, which are the first set of five Ss in the 12 S framework. Meaningfully combining the PIM study with globally acclaimed consultancy studies such as AON Hewitt can result in the next three Ss in the 12 S framework. Say refers to the freedom to express oneself. Stay is the continuation with the existing organisation. Strive refers to the effort one puts into his/her work. The combined effect of engaging and enabling employees is the employee effectiveness. The achievement of objectives in performing up to the expectations, which legendary Peter Drucker called “doing the right things”. Effective employees contribute to the achievement of results in a balanced manner in line with the Balanced Scorecard pioneered by David Kaplan and Robert Norton of Harvard Business School, in early nineties. The four facets of financial, customer, processes and people are all integrated, interrelated and interwoven, in demonstrating the path towards excellence. Four key elements in effectiveness outcomes have been identified as strategic competencies, streamlined processes, satisfied customers and sustained financials. These are the final four Ss of the 12 S framework. Strategic competencies refer to the people perspective of the Balanced Scorecard where innovation is the key. In fact, competencies lead to compete in a competitive environment. Streamline processes refer to efficient and consistent functioning of the input to output conversions. Satisfied customers and sustained financials are obviously essential for survival and success of any enterprise. The survey results indicated that the engagement level among the surveyed employees as 40%. Low engagement is shown in 17% of employees; 42% of male employees show high level of engagement and 20% demonstrate low level of engagement. Among the female employees 37% show high engagement and 13% show low engagement. The executives display lower level of engagement at 31%, whereas the non-executives display 51% of engagement. Overall male employees show higher level of engagement, and employee and non executives show higher level of engagement. Significantly, 89% of the apparel sector employees were aware of what was expected from them at work. 74% of employees trust the senior management while 72% of apparel employees believe that they have mutual respect at work and 71% of employees knew their potential career path at their work place. Also, findings of the apparel employees revealed that, 22% perceived that promotion opportunities were not purely based on their performance, 12% responded that they were not rewarded adequately, 12% responded that performance evaluations did not reflect the effort they have put at work and 11% responded that managers were not aware about what motivates them at work. The key findings of IT, ITES and KPO, BPO sectors in Sri Lanka indicated that overall EE level is 31% based on the surveyed sample. In addition, it was noted that male employees are more engaged than female employees in both these sectors; 50% of the male employees in KPO, BPO industry demonstrated a low engagement level; 39% of IT sector employees are highly engaged in their job and 16% show low engagement; whereas 26% of KPO, BPO employees are highly engaged in their job and 33% show low engagement. Overall, IT sector employees are more engaged than KPO, BPO sector employees. The findings indicate that executives show lower level of engagement than the non-executive employees do. The survey findings have several implications for the human resource professionals in Sri Lanka. The findings indicate that immediate supervisors are less supportive. This implies that immediate supervisors should be selected correctly and trained on soft skills. Non-availability of career development opportunities implies that employees will leave the organisation for better opportunities. Employees feel that the organisational policies and procedures are biased. This implies that the organisations are not transparent in their policies, and even if they are, that there is a communication gap between the senior management and the employees. Therefore, it indicates that senior management should have a better rapport with the employees. Specific findings in the Sri Lankan apparel sector indicate that the industry leaders and relevant authorities should focus on upgrading and development of performance management systems and appropriate policies and ensure a rigorous, transparent and continuous cycle of improvement, review salary levels and welfare facilities given for apparel employees regularly and more willingly. Employee productivity and quality levels could be enhanced through career development programs. Implications for the IT and KPO/BPO industry indicated that in order to drive EE levels in the IT sector, more career development opportunities must be available to employees who are over 30 years. In order to drive engagement levels in the KPO, BPO sector, the organisations should take measures to improve dialogue with the senior management and the employees. More improvement to increase organisational procedures and HRD practices are necessary in this sector. Using stringent selection methods to select the best managers and improving teamwork and enhancing co-worker social support could drive EE levels in this sector. In summary, the survey results indicated that meaningfulness and the awareness of the job and supportive senior management are factors that drive EE in the IT and apparel sector while supportive co-worker relationship and meaningfulness and awareness of the job plays an important role in the KPO/BPO sector. More such research are needed to cover many sectors in Sri Lanka in shedding more light into how employee engagement leads to enterprise effectiveness.